The book of SeaWorld's massive public relations circus has added another chapter this week - and it's a thick one. The journalist Karl Taro Greenfeld published a comprehensive piece in Bloomberg Businessweek with the headline "Saving SeaWorld." The piece consists of a summary of the recent troubles facing the company after the release of the documentary "Blackfish," as well as a heretofore unseen look at the man behind it all: CEO Jim Atchison. 1. Greenfeld says that SeaWorld cares for orcas in the real world. Atchison then supports this claim with rescues in Florida - though SeaWorld does not rescue orcas in Florida. There is also no mention in the piece of actual orca rescues carried out by SeaWorld. Atchison adds that critics of SeaWorld fail to account for how toxic and dangerous the real world can be for orcas. "We cooperate with studies right off the coast of Florida, and we find that calf survival rates are down. They're consuming fish that have mercury, other pollutants, and those fish consumed other fish that had that." 2. Atchison addresses the tragic death of Dawn Brancheau, the SeaWorld trainer who was killed by an orca named Tilikum in 2010. He says that the job of a trainer "has its own risks." "I happened to be at that park that day. I knew Dawn from having run that park for years. She was a remarkably engaging, warm, bubbly cheerleader. Things do not get worse than that day. But it is extraordinary work that people like Dawn do, and it has its own risks." 3. Atchison is clearly ready to "get his people back in the water with the whales," after the company was prohibited from the practice by the Occupational Safety and Health Administration. "We've had millions of occasions to interact with them. We had one that ended horribly. It does not mean we have not had other issues once in a while. I have to say it's pretty rare. It's extremely rare." 4. SeaWorld is planning to expand internationally to places where "sensitivity around marine mammals is different." In fact, SeaWorld can breed enough whales to seed another park, but in the wake of Blackfish, Atchison is wary of opening another SeaWorld in the U.S. or Europe. Cultural sensitivity around marine mammals is different in, say, China, the Middle East, and Russia. 5. Atchison concedes that the whales are the brand - and his fiduciary responsibility. "Our killer whales, our killer whale program, and all of our animals are emblematic of the whole brand. I have to protect our brand. I have to grow our brand. How we care for those animals may make me feel good morally, but that is also my fiduciary responsibility." 6. The story's pièce de résistance: SeaWorld's vice president of communications once, inexplicably, drank orca milk. Fred Jacobs, the vice president for communications, a veteran of SeaWorld who goes back to the Anheuser-Busch ownership-a time when there was free beer available at every SeaWorld-is standing by the coffee. He sees me adding milk and says, "I once had killer whale milk. I'll starve to death before I have that again. It tastes like fish. It's got like 15 times more fat than cow milk." 7. He wasn't the only one. 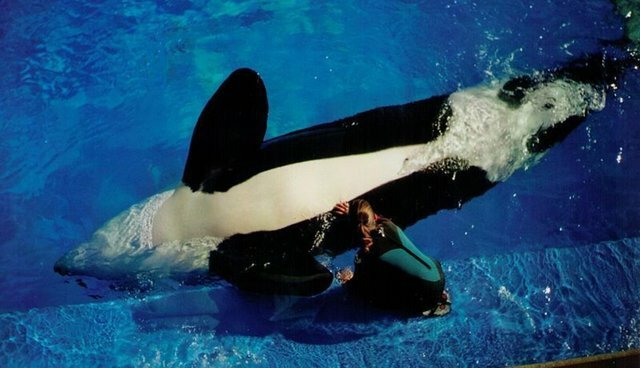 SeaWorld's domestic breeding program, in addition to frequent testing of pH levels to see when female whales are ovulating, also stores plenty of killer whale milk in case a mother rejects her calf. Apparently, the staff used to taste the milk, and nobody gave much thought to that. Those days are definitely over.